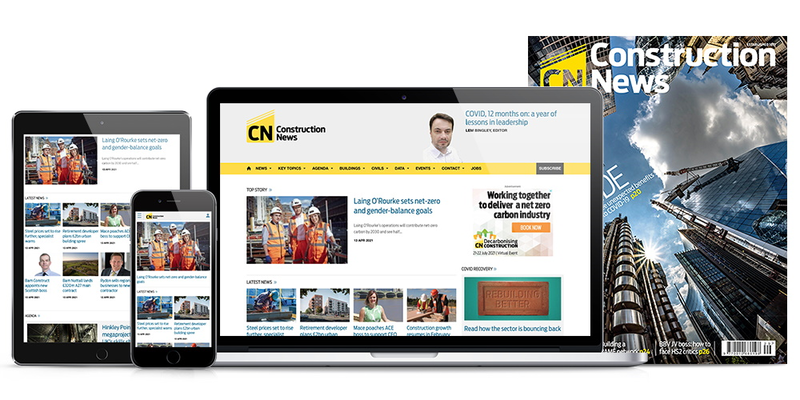 Construction News has been delivering exclusive news on projects and contracts, client insight, industry-leading data & forecasts and though-provoking opinion for nearly 150 years. CN Corporate extracts the intelligence relevant to your business and delivers it using the technologies that suit your organisation best. If you are looking for 10 or more subscriptions, speak to a member of our sales team today on +44 (0) 203 953 2729 or click 'Find out more'. I subscribed by telephone, how can I access My Account? If you provided an email address when you subscribed, a confirmation email was sent to you with a link to create an account online. If you have not yet registered, please register here using the same email address provided. Your online account will automatically be linked to your subscription. We will contact you before the expiry date of your subscription to ensure that your renewal is taken out in good time, so that you don’t miss out on any news or information from us. If you wish to renew at any other time, please call us on +44 (0)203 953 2150 or log into your online account. Please have your subscription number to hand so that we can easily find your account. Yes, and we offer heavily discounted prices for group and corporate subscriptions with many exclusive benefits not available to individual subscribers. Please visit our Corporate Subscription page here. Are my payment card details secure if I subscribe online? What's the benefit of paying by Direct Debit? Direct Debit is a continuous payment method available in the UK which means that you do not need to remember to renew your subscription each year. Can I pay in a currency other than sterling (GBP)? We currently only offer payments in sterling. If you make a payment from outside the UK, you will automatically be charged at the prevailing exchange rate. This can be found by logging into your account online or on the invoice originally sent to you. If you cannot find it, please contact our Subscriptions Team or call +44 (0)203 953 2150. Please visit your My Account to check the expiry date. If your subscription is due to expire, you will be able to renew it here too. Subscribers have unrestricted access to all content on the Construction News website. You will need to sign in using your email address and password and can do so here. If you need any help, please contact our Subscriptions Team. Check that the email address that you have registered on the website is the same as the one you used for your subscription. Please visit your My Account page and check that your subscription is showing and is currently live. If not, please contact our Subscriptions Team. Check if your subscription has lapsed. To check your status, please log out and log back in again, and go to your My Account page, which will show your subscription status. If you are still having problems, please contact our Subscriptions Team or call +44 (0)203 953 2150.